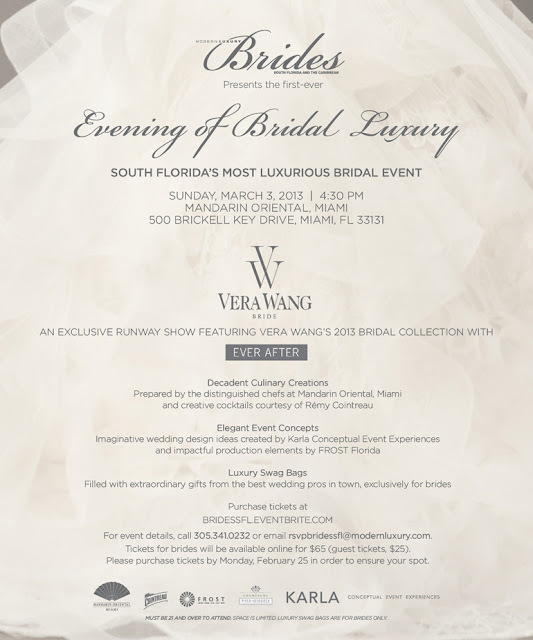 What: "Evening of Bridal Luxury" where you will be greeted with cocktails from Remy Cointreau and bites by the culinary experts at the Mandarin Oriental. You will then be whisked away to the ballroom for the much anticipated Vera Wang runway show, where your eyes will feast on breath-taking beauties. After the show you will get the opportunity to see luxurious bridal decor trends of this upcoming season. Not to mention a pretty little swag bag that includes a Vera Wang Lovestruck perfume. Tickets are $65 for the bride and $25 for guests, to purchase your ticket go here. Hope to see you there, I am looking forward to it as this will be my first official bride event.